After Denver’s playoff defeat at the hands of the Oaks, Denver’s front office knew it had to improve the team’s talent level. 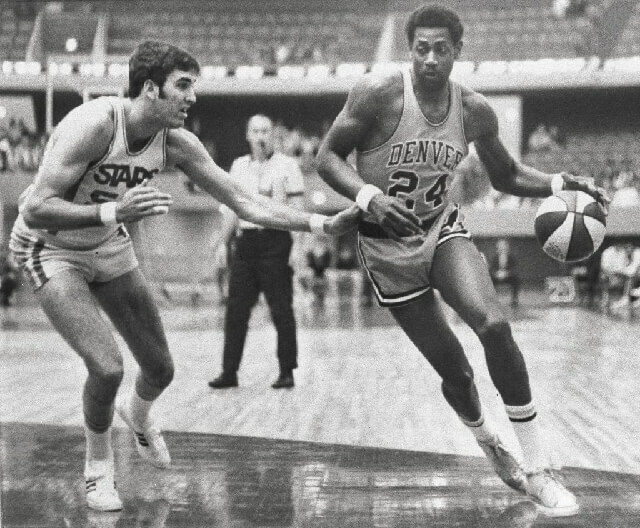 The Ringsbys contented themselves (and shocked the basketball world) by signing an undergraduate phenom from the University of Detroit: Spencer Haywood. The 6’9″ Haywood had played only one year of junior college ball (at Trinidad Junior College in Colorado), and one year of Division I basketball at Detroit. But, having averaged 32.2 points per game at Detroit (he was an All-America choice as a sophomore), and having sparked the U.S. Olympic Basketball Team to a gold medal performance at the 1968 Mexico City Summer Games, Haywood was bored with college ball. Despite protests from the NCAA and the NBA (and even some ABA owners), Haywood was allowed to play for the Rockets, even though he had not completed his four years of college eligibility. Haywood was the very first pro player to take this route. The Rockets publicly explained it as a “hardship” exception, designed to allow Haywood to provide for his large family (including his mother and nine brothers and sisters). Haywood’s presence made a huge impact on the 1969 – 1970 Rockets.